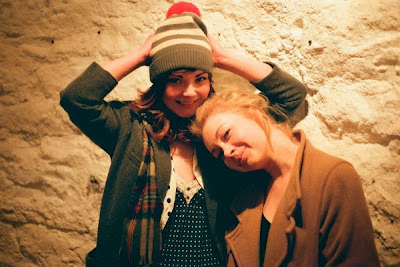 Everyone say hello to Honeyblood, a Glaswegian garage duo with a nice line in knitted hats. They are Stina Tweeddale and Shona McVicar, aka "short and shorter" (their description). A stripped-back guitar'n'drums combo, they're essentially The White Stripes without all the testosterone and sexual tension. So far, they've only had one release, No Spare Key, on a blood red cassette tape that sold out months ago. All traces of the song have, rather excitingly, disappeared from the internet in the meantime. But their first vinyl single, the short-and-sweet Bud, is coming out on FatCat records next month. Produced by Rory Attwell (Palma Violets, Veronica Falls), the duo have described it as "crunchpop". It's a little bittersweet, but if you're a fan of The Breeders, Best Coast or Juliana Hatfield, you'll find it to your taste.